Learn how blended learning has been served up in media centers from around the country. Each media center has taken their own twist on how to define, implement, and assess the blended learning process. This hands-on webinar will allow participants to explore and compare the different blended learning strategies that work. How will you create your blended learning media center? 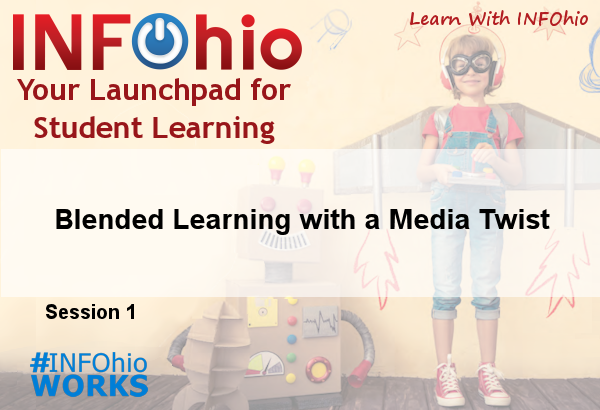 Use this url to bookmark or link to Boot Camp 2017 Session 1 - Blended Learning with a Media Twist: https://www.infohio.org//pd/webinars/recordings/item/bc2017s1. Marcia Kish is a Blended and Personalized Learning Specialist and the Chief Innovation Officer for DSD Professional Development. With over nine years experience as a blended learning coach, she has developed a three-phase implementation process that will transform the traditional classroom to an environment that focuses in on the use of data to drive instruction that will allow students to move at their own pace, place, and path.